Jeff Gordon has refused to apologise for deliberately taking Clint Bowyer out of last Sunday's NASCAR Sprint Cup race at Phoenix. 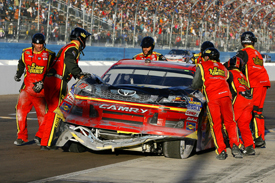 The Hendrick Motorsports driver and his Michael Waltrip Racing rival collided with seven laps to go; Gordon retaliating for an earlier incident with Bowyer. Both drivers hit the wall hard, collecting an innocent Joey Logano, while new championship leader Brad Keselowski avoided getting involved. The clash then led to a physical exchange in the garage area, where members of both drivers' teams argued before officials intervened. Bowyer also tried to get to Gordon after stopping his wrecked car in the pits, but officials were ready to prevent the exchange from going any further. "Things have escalated over the year and I have just had it," said Gordon. "Clint has run into me numerous times, wrecked me and he got into me on the back straightaway, pretty much ruined our day. I've had it, was fed up with it and got him back." Gordon was summoned to the NASCAR hauler after the race. Despite no penalties having been handed out yet, Gordon does not expect to escape punishment. "They've got to do what they've got to do, just like I had to do what I had to do," he added. With Gordon's team-mate Jimmie Johnson crashing out, a strong finish for Bowyer could have taken him into this weekend's season finale in with a chance of becoming champion. Instead, he is now too far behind in the points race to have a hope of the title. Bowyer, who has now dropped behind Kasey Kahne to fourth in the points, labelled Gordon's actions as "embarrassing" and "ridiculous". "The last person in the world you want to get into anything with is Jeff Gordon on the race track," said Bowyer. "I mean, you're down there racing, the track's extremely slick, we're all on tyres. I didn't even need to pass him. That's the thing. All I was doing is riding around biding my time. "I barely touched him and then I feel him get into Turn Three and try to turn me and he missed and then next thing I know Brett's [Griffin, Bowyer's spotter] telling me on the radio that he's trying to do. He's waiting on me. "It's pretty embarrassing for a four-time champion, and a driver I consider one of the best this sport's ever seen, to act like that. It's just completely ridiculous." Bowyer also spoke to officials in the NASCAR hauler following the race, but said he did not exchange words with Gordon. NASCAR's vice president of competition Robin Pemberton didn't anticipate what action, if any, would be taken against Gordon. Similar actions have previously caused suspensions, like Kyle Busch's last year following a clash with title contender Ron Hornaday during a Truck Series race at Texas. "You can read into it in a lot of different ways depending on which way you're leaning, even before you see the tape" said Pemberton. "But the best thing is to meet with the teams and meet with the drivers, try to put this behind us and go to Homestead and finish the season off."